From 2005 to 2007, the World Society for the Protection of Animals (WSPA) researched live animal transport routes in an effort to identify those that caused the most aggregate suffering. Among the worst offenders: a 4,000-mile, week-long trip from the U.S. mainland to Hawaii. The journey begins when the pigs are first transported by truck to California. Depending on their origin, the ride can cover more than 2,000 miles. After arrival, the pigs eventually depart for Hawaii via container ship. On board, pigs are provided with less than 5.5 square feet to move about. Each vessel contains only one livestock attendant tasked with watching up to 115 pigs. According to WSPA (PDF), "the effect of transport-related stress on pigs is measured using behavioral indicators such as open mouth breathing/panting, avoidance, aggression and fighting, self-mutilation, stereotypic behaviors and vocalization. Physiological indicators include changes in hormone and enzyme levels, heart rate, respiratory rate, muscle tremors and body temperature." 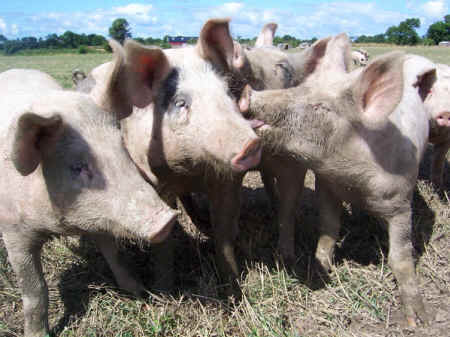 Pigs are highly social, perceptive, intelligent animals. Much like dogs, pigs have the capacity to recognize moods, form friendships, empathize with the needs of others, and of course, experience fear and pain. The stress of long distance transport of pigs drastically increases their susceptibility to disease, boosting the risk of foodborne illnesses such as Salmonellosis, the second most common foodborne illness in the United States. After 5-7 days, the pigs arrive in Hawaii. From this point, most are shipped off to the Hawaii Livestock Cooperative slaughterhouse, which received more than $600,000 in grants and forgivable loans paid for with U.S. tax dollars. The Hawaii Cooperative has been cited multiple times for violations of federal humane slaughter requirements. WSPA believes the existing slaughterhouse owned by the Hawaii Livestock Cooperative could provide a federally-inspected slaughter facility for locally-raised pigs. Additionally, the market for chilled and frozen meat has remained stable, and could provide an adequate economic substitute for live imports. Hawaii Free Press reports that a petition on Change.org calling for an end to live animal exports to Hawaii from the U.S. mainland has already gained 20,000 of the 25,000 supporters needed.